The Salon International de la Haute Horlogerie 2019 rang in the new year in watchmaking recently in Geneva. The watch fair—dedicated to press, retailers, and watch collectors and enthusiasts—opened its doors with a slew of wild new releases in an effort to appeal to younger, flashier clients with cash to burn. But the best pieces came from watchmakers that chose to stick close to their roots by focusing on interesting new mechanical inventions, expert-level finishings, and artful new ways of telling time. Here are the exceptional new models that debuted at SIHH. One of the top highlights of the SIHH was Vacheron Constantin’s premiere Twin Beat timepiece, which was displayed (most of the time) behind a giant glass vitrine in the center of the watchmaker’s boutique surrounded by swarms of photographers and admirers. The new timepiece is not only visually appealing in design, but it comes with a revolutionary new user-controlled dual frequency that allows the wearer to switch between an active frequency of 5 Hz and standby frequency of 1.2 Hz. 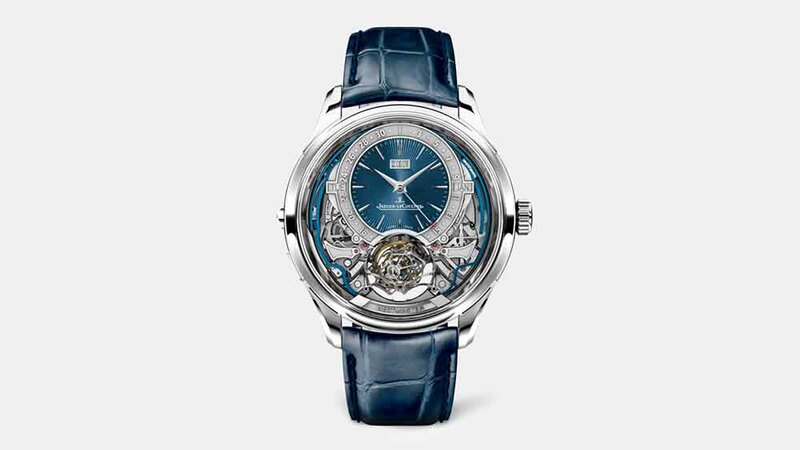 Normally, timepieces (such as Vacheron Constantin’s new Overseas Tourbillon) operate at 2.5 Hz on average. This function, controlled very easily by a simple pusher and indicated by a small arrow on the left-hand side of the watch, allows for the wearer to switch to a lower frequency when they know they won’t be wearing the watch, in order to keep the watch running for a longer period of time. The big news is that if you were to keep this watch running at a slower 1.2 Hz it will run for 65 days—that’s a whopping two months, which is a singular amount of power reserve in the world of mechanical watchmaking. It’s a lot of watch boiled down into just 42 mm. This is particularly appealing in a perpetual calendar, which typically has to be reset by a watchmaker after it has run down its power reserve, due to the complexity of rebooting this particular movement. That means fewer visits to your watch doctor and more time to show off this beauty to your friends—if you’re lucky enough to get your hands on one. 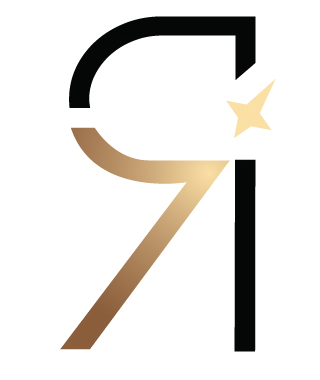 Due to its difficulty to create, only a handful of these will be made each year. It already had a years-long waiting list on the day of its debut. Strap: Gray hand-stitched Mississippiensis alligator leather strap with Maltese cross–shaped platinum pin buckle. First unveiled in 2016, the Datograph Perpetual Tourbillon is a flyback chronograph, perpetual calendar timepiece with moon phases, a power reserve indicator, and a tourbillon with stop seconds all rolled into one. Its latest iteration is now in white gold with an 18-karat pink gold dial—not to be mistaken for a salmon dial, although similar in appearance. The first edition came in a platinum case with a black dial and, like the newest Datograph, was limited to just 100 pieces. The tourbillon, when it was unveiled three years ago, was an update to the Datograph that was born in 1999. The tourbillon’s larger case size meant that the subsidiary dials, which house the perpetual calendar, could be enlarged. The seconds, the day of the week, and the day/night indicator are on the left side of the dial, while the jumping minute counter, the months, and the leap year are displayed on the right. The moon phase, the day, and the month can all be adjusted via three recessed correctors, and a pusher at 10 o’clock changes the calendar displays collectively. Other than its striking appearance due to its new dial, this timepiece (like all of Lange’s watches) is immediately recognizable as a cut above the rest when you flip it over to take in the Caliber L952.2. All of its 729 parts have been manually finished to such pristine perfection that even a novice to watchmaking would immediately recognize its quality. Strap: Dark brown hand-stitched alligator leather with deployment buckle in white gold. 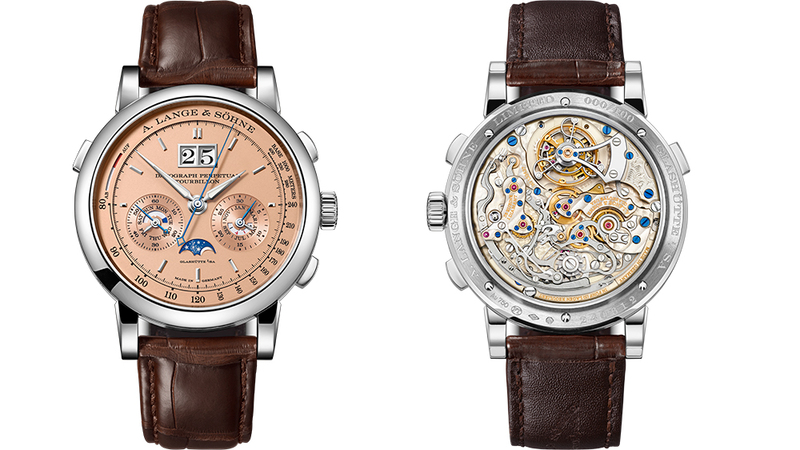 In celebration of the 10 years of its first mechanical wristwatch with a jumping digital display, A. Lange & Söhne outfitted its anniversary model with a new movement and a new date ring. The glass date ring comes with the standard date numbers of 1 to 31—the current date is indicated when the numerals appear in red. The new feature is a nice way of incorporating a date without using a date window. Date windows have been known to turn some collectors off, but the real reason for the new date ring design is that the large numeral discs and time bridge at the center of the digital display make it impossible to create a conventional date display. The easily legible hours and minutes are controlled by the new manually wound Caliber L043.8. Its patented constant-force escapement powers the balance with a consistent amount of force and delivers a one-per-minute impulse required for switching the discs on the digital numeral display. Like the Datograph, the new Zeitwerk comes with an impeccable level of craftsmanship on the movement, seen on its 516 parts visible through the caseback. Here we have an extremely complicated example of haute horology from Jaeger-LeCoultre—and it’d better be, at close to a million dollars. It’s the brand’s fifth multiaxis tourbillon and it comes with a minute repeater with patented crystal gongs that play the Westminster melody known to those who have witnessed London’s Big Ben clock tower in action at Westminster Palace. On top of that, it’s also a perpetual calendar that can be adjusted in both directions. All of that, incredibly, comes in 43 mm for a wearable timepiece that has a lot of watchmaking to offer its wearer without weighing down the wrist. 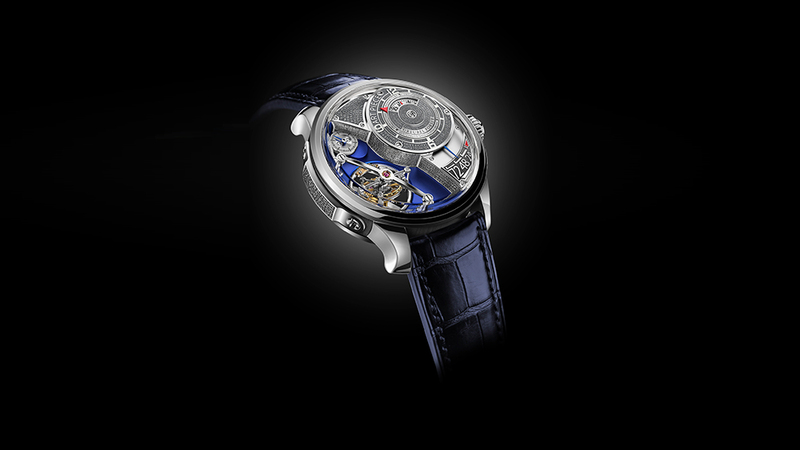 The tourbillon is viewable on both sides of the case, as are some of the movement parts. These high-end complications coupled with a well-thought-out design make for the ultimate collector’s piece. Let’s not forget that in addition to being mechanical marvels, watches are beautiful objects and heirlooms meant to be appreciated for their exterior as much as their interior. Hermès takes the cake for one of the most magnificent dial designs of the year (so far) with its pumped-up version of a moon phase. 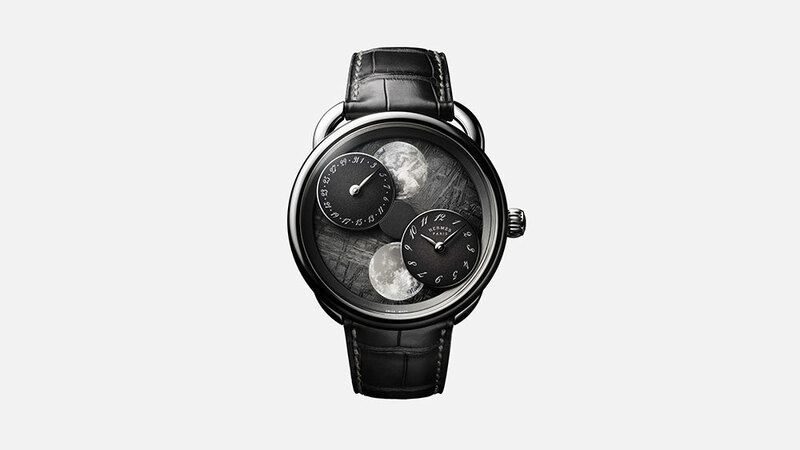 Instead of the traditional function where the moon, typically at 6 o’clock, rotates to show the time of day, Hermès has turned the tide on the complication by keeping the mother-of-pearl lunar replicas of the Northern and Southern Hemisphere moons stationary at 12 o’clock and 6 o’clock while the hour and minute dials revolve around the circumference of the meteorite or aventurine dial. Back in 2006, Robert Greubel and Stephen Forsey invented Harry Winston’s Opus 6—a complicated design with disc displays for the hours, minutes, and power reserve in an unusual architecture and three-dimensional movement with a unique open dial. 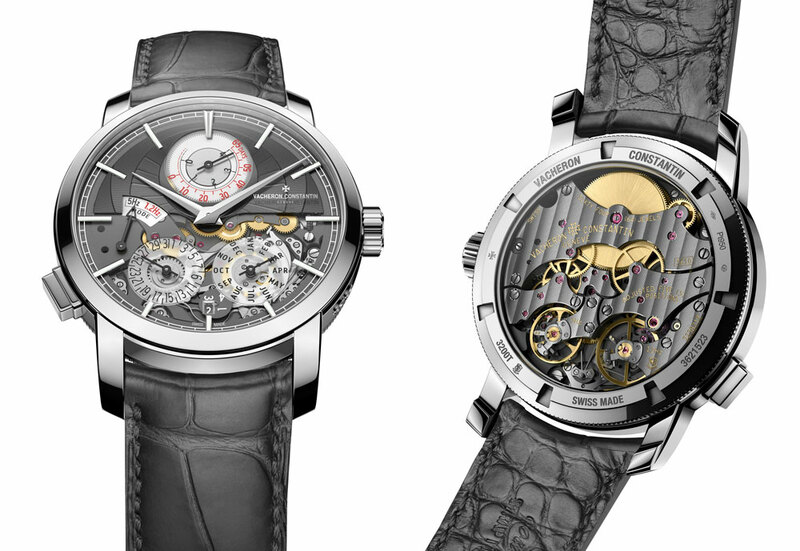 Playing on that design and previous Art Piece creations, the duo has created a new movement that is a variation of the original, with a 475-part hand-wound movement with 72 hours of power reserve (indicated between 4 and 5 o’clock) and a mechanism that enables the balance wheel to oscillate in all planes for ultimate precision. A sub-seconds display is located between 10 and 11 o’clock, while the hours and minutes are offset to the upper right side of the brilliant blue dial. Adding an insane level of detail and artisanal craftsmanship to the timepiece are 1,045 engraved words to illustrate Greubel Forsey’s idea of the “spirit of time,” as they call it. 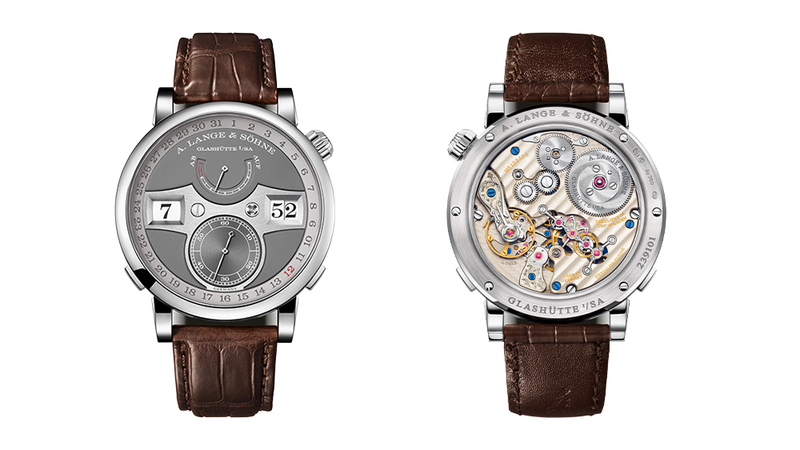 Through the caseback is a view of the movement along with relief-engraved signatures of the two watchmakers. Strap: Blue alligator leather strap.